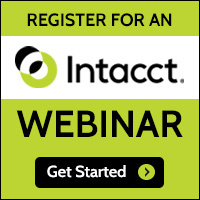 Sage Intacct delivers a suite of best-of-breed cloud-based accounting and financial management applications that use open web services to integrate with a broad set of leading applications. Sage Intacct is the preferred provider of financial applications for the AICPA Trusted Business Advisor Program. While Cordia is a value-added reseller of Sage Intacct’s financial management software applications, we also offer Sage Intacct software bundled with our outsourcing services. When bundled, this platform can be provided at a very effective price point for smaller businesses. Larger organizations can also take advantage of Sage Intacct’s sophisticated software, bundled with our outsourcing services, at enterprise pricing. Because we service many of our outsourced accounting clients using Sage Intacct, our consultants are fully trained and certified to implement and integrate the system, while leveraging the best practices that we have developed as users of the system. Our team of Sage Intacct consultants work seamlessly with our clients to deliver sustainable business results tailored to both the unique dynamics of their industries and the individual needs of their businesses.